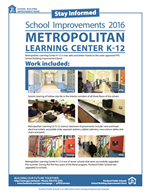 As part of the School Building Improvement Bond, Metropolitan Learning Ctr K-12 received some building level seismic strengthening, accessibility improvements and science classroom improvements. Click here to view a photo album of MLC under construction in July, 2016. 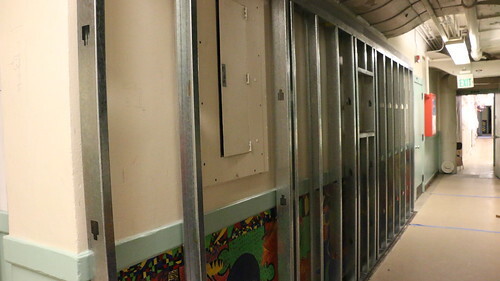 Seismic bracing of hollow clay tile in the interior corridors of all three floors of the school. Metropolitan Learning Ctr K-12 science classroom improvements include: new overhead electrical outlets, accessible sinks, eyewash stations, added cabinetry, new science tables and chairs and paint. Two new ADA drinking fountains and new door hardware. Please view the flyers below to learn more about the work done at MLC in the summer of 2016.